Interviewing for a job can be challenging, especially if you don't tend to switch jobs much or haven't otherwise had a lot of interview practice. If you're interviewing for a position that's a big step up from your current job, or going to interview with a highly competitive company where the interview process involves different rounds or a panel of interviewers, what can you do to slant the odds in your favor and make sure the interview process isn't completely scary and nerve-wracking? You might be fine on your own, or you may need professional help if the thought of interviewing one-on-one with a hiring manager or other personnel seems very stressful. First of all, it helps to understand how interviewing works and what you can expect during an interview for a new job. Consider the best way to prepare—one way to help improve your interview skills is to work with a coach. During interview coaching, job seekers meet with a professional coach to learn various interview strategies. This service is offered by career coaches and career service offices. 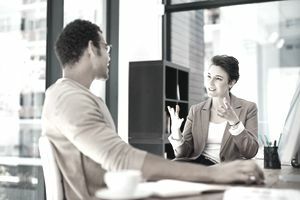 Going through interview coaching can help job seekers develop a variety of skills and techniques that are useful for interviews. It's also a way to prepare for—and feel more confident about—upcoming interviews. Should you work with an interview coach? And if so, how will you find one? Get information on exactly what will take place during the coaching sessions and see if this service makes sense for you. Interview coaching can help increase your chances of getting a job for a number of reasons. Coaching gives you experience answering many different interview questions and interacting with potential employers. Coaches can provide you with valuable feedback that will help you improve your responses during interviews. The more you practice with a coach, the more confident you will be. You should feel confident walking into any interview and a coach can give you the tools to feel self-assured. You get extremely nervous before interviews. Practicing with a coach can help you feel more comfortable and prepared. You get interviews but not offers. An interview coach may be able to reveal what's going wrong. Perhaps you're failing to trumpet your accomplishments or to show off the correct skills. It's been years since the last time you interviewed, because a coach can help you rehearse and re-discover those skills you haven't used for some time. You have an 'issue.' Did you get fired from your last job? Are you switching fields or industries? An interview coach can help you learn how to address these topics during interviews. You've got an interview lined up with your dream job. Want to feel extra-confident during your interview for your dream position? Targeted practice with a coach may be helpful. If you're a confident interviewer and tend to perform well during interviews, this service might not be necessary for your job search, although it can benefit just about anyone. There are many types of interview coaching. Some coaches meet with you in person and others speak with you online or by phone. Whether you meet in person, online or over the phone, the coach typically conducts one or more practice interviews and then provides you with feedback. He or she may also provide a list of typical interview questions and help you prepare answers to these questions. In an online interview, a coach may interview you over a video chat service. Or coaches may ask for you to send a video of your answers to a list of interview questions. Coaches you meet over the phone will typically conduct a mock phone interview. If you meet the coach in person or online, he or she can also help you to develop effective nonverbal communication. The coach can show you facial and body language that will demonstrate to the employer that you are friendly, are very interested in a particular conversation, or that you are actively listening. Coaches may also help you with other elements of the interview, including how to ask the right questions of the employer, how to prepare for an interview (including ways to research the company and learn more about the position), and even how to dress. Some coaches can help you with particular interview situations such as panel interviews or interviews that involve a presentation. There are many different ways to find an interview coach to help you brush up your skills. Your college career services office may provide free or discounted interview coaching to alumni, as well as to students. Check to see what services your school offers, and find out how you can tap into available resources. Distance counseling by phone, chat or Skype etc., may be available. Professional career coaches are typically trained as interview coaches. However, be aware that most of these services cost money, so research prices when looking for a coaching service. Along with asking friends for recommendations, you can also search for interview coaches on the Professional Association of Resume Writers and Career Coaches website. If you cannot afford a coach, there are some opportunities for less expensive or even free coaching. Check out your local library to see if they hold any free interview or career workshops. State and local agencies also offer career assistance for free to local citizens. Consider creating a job club with friends or associates, in which you give each other mock interviews. Another option is do-it-yourself practice interviewing. Do you have a friend or family member who can ask you some of the most frequently asked interview questions so you can practice responding? Even this type of casual practice will help you to feel more comfortable when you're participating in a real interview.